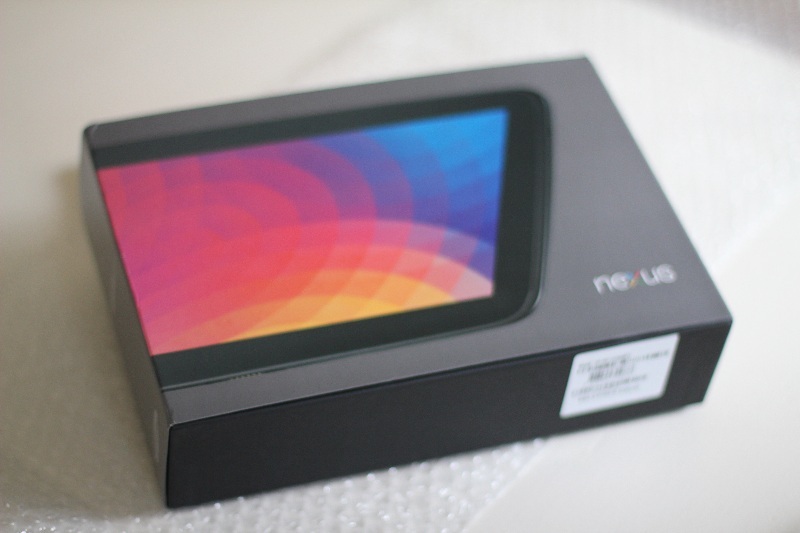 Santa was early this year and today my Nexus 10 arrived. 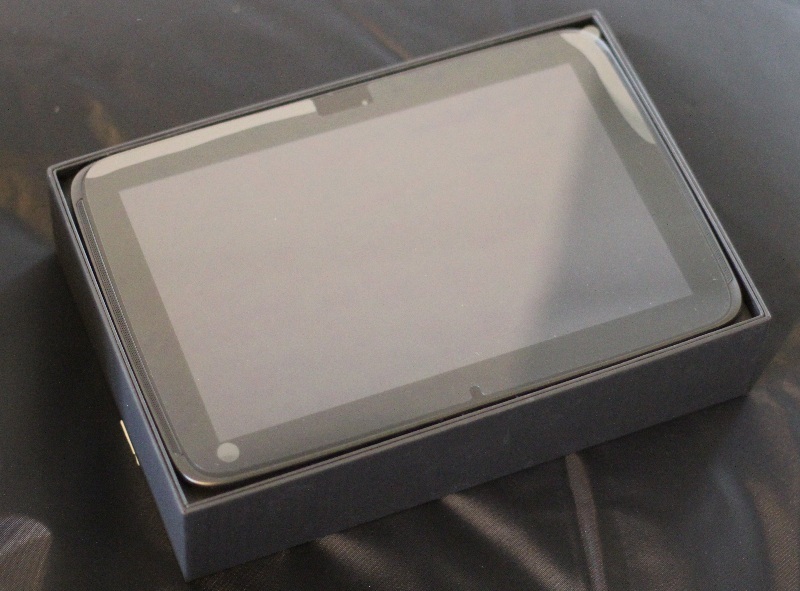 Carefully opening the box reveals the Nexus 10 complete with protective plastic. 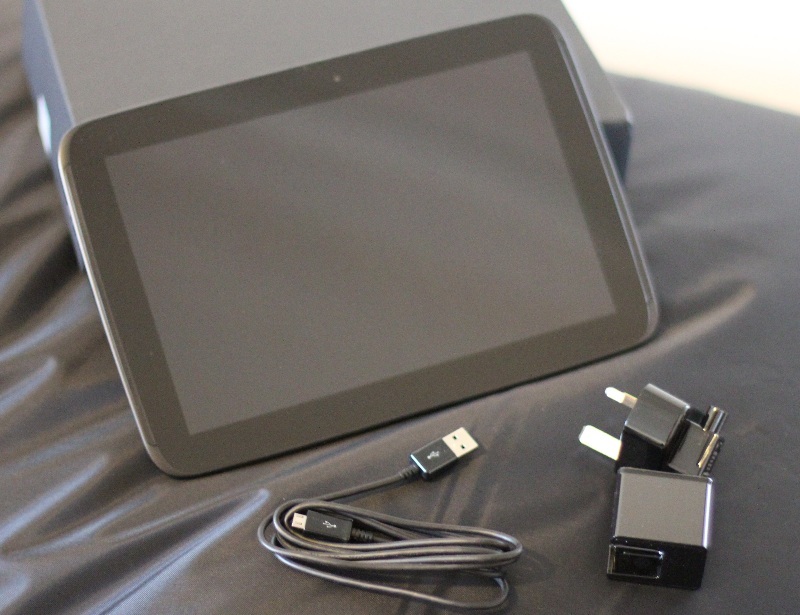 Under the Nexus 10 we find the charger, a UK plug for the charger, a micro USB cable, a quickstart guide and some warranty information. The majority of the space in the box is occupied by air. After removing the unnecessary parts (protective plastic, quickstart guide and warranty information) this is what remains. Actually the UK plug is useless for me and Handtec had promised to include an international adapter but they had forgot to include it. However they quickly responded to my mail and promised the send me one. Luckily I have a lot of micro USB chargers so I'll manage for now. 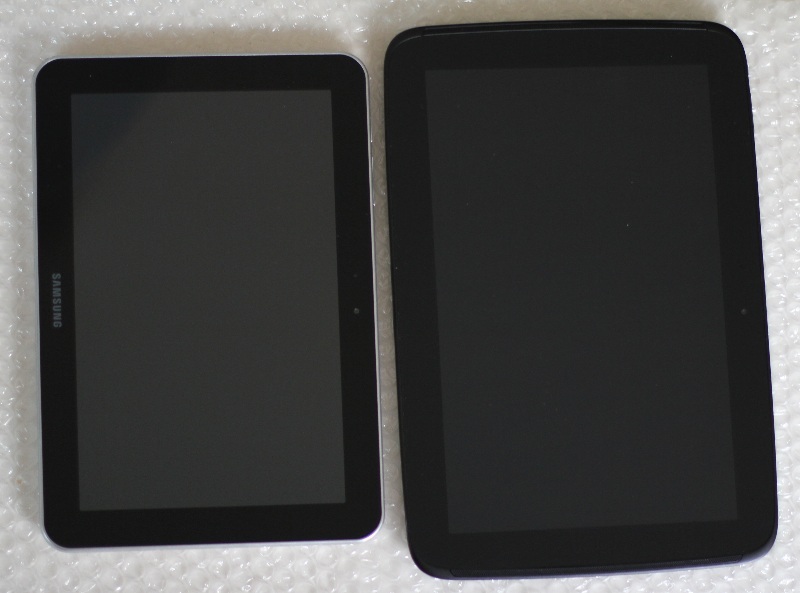 Side by side comparison with my Samsung Galaxy Tab 8.9. 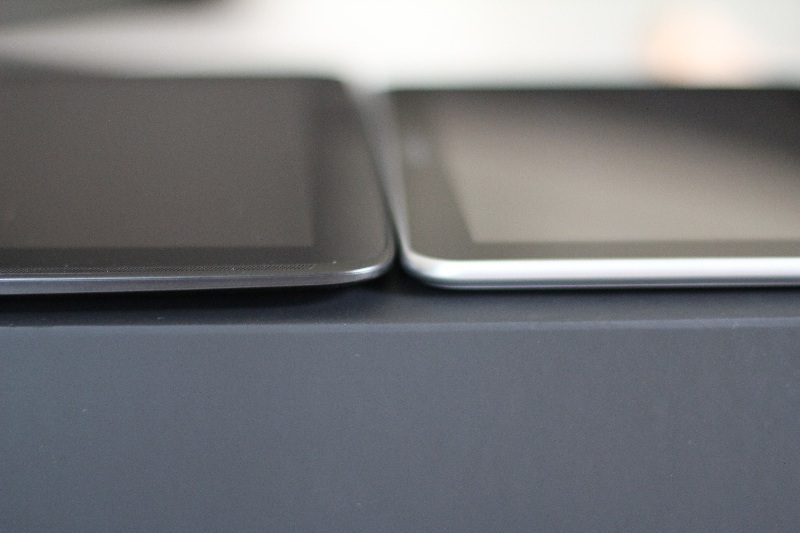 Thickness seems pretty much the same but the Nexus 10 is thinner at the shorter edges while the Galaxy Tab 8.9 has the same thickness on all the sides (Nexus 10 to the left). 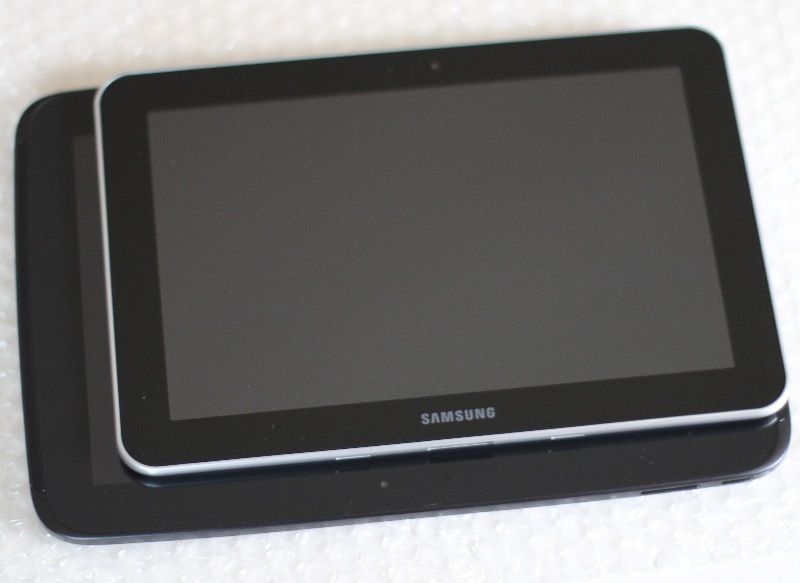 The Galaxys Tab on top of the Nexus 10. After a short time of using the Nexus 10 it got a 60Mb OTA upgrade. Not sure what changed but I do not think it had the lock screen widgets before the upgrade (but I could be wrong). Compared to my Tegra2 based tablets it's really fast but someone who compared the Nexus 10 with a Galaxy Note 10.1 felt that the Note 10.1 was slightly more responsive. Considering the massive amount of pixels the Nexus 10 has to push I wouldn't be surprised if it isn't the fastest tablet in all benchmarks. High resolutions usually has a price. However so far I feel it is "fast enough" and the screen is really good. Although I still consider the screen on my Galaxy Tab 8.9 to be very good with it's 1280x800 pixels you can easily see the difference when you compare it to the Nexus 10. I have not had that much time to play with it yet but it runs Netflix perfectly and I also tried hooking it up to my 42inch plasma using a micro HDMI cable it it worked as intended. The only thing that I'd like to chamge is the placement of the virtual buttons that in Android 4.2 is centered and not left aligned as they are on tablets with Android 3.0 to 4.1. I'm used to reaching the buttons with the left thumb even in landscape mode and with this new centered buttons the joints in my left thumb are already starting to hurt. The is the fifth tutorial for External Keyboard Helper. You'll find a all the tutorials here. 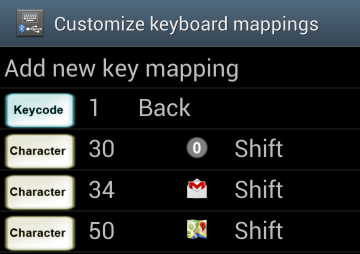 A nice feature in External Keyboard Helper is the possibility to add Application shortcuts and Text strings to keys. 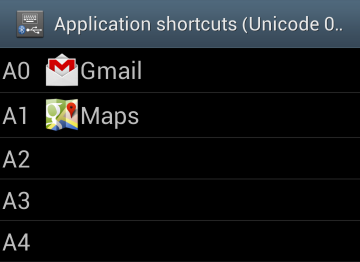 In this example I will configure Alt+G to start Gmail and Alt+M to start Maps. 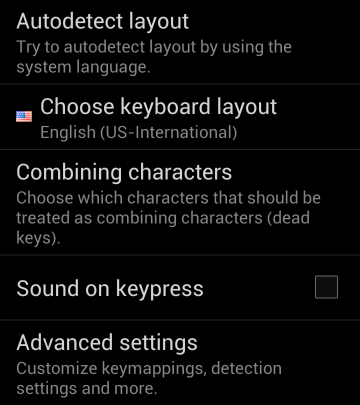 I will also make it possible to quickly write http://www.apedroid.com by just pressing Alt+A. 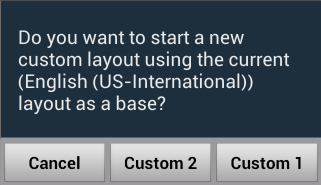 I will not go into details on how to create a new custom layout, go to the second tutorial for that. 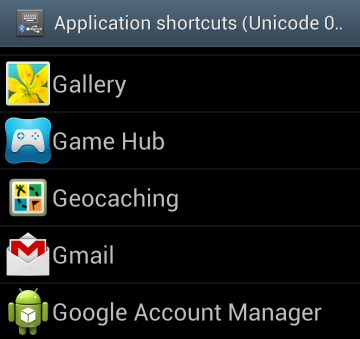 First I enter the Advanced settings and choose to setup some Application shortcuts. Right now all the slots A0 to AF are empty. I select the first slot, A0, and a list of all my installed and system apps shows up. From that list I select Gmail. I repeat the procedure for A1 and select Maps and when I'm done the list looks like this. Now I go back into Advanced settings and choose to configure Text strings. Also here we find 16 empty slots, T0 to TF. In the first slot, T0, I enter http://www.apedroid.com. Do not forget to scroll down to the bottom of the list and press Save. Now all that is left is to map them to keys so i choose to customize my layout. If I would already have mappings for G, M and A then I would need to select those from the list but since I'm using the English(US) layout in this example there are no current mappings to those keys so choose to add a new mapping. First out is G which has scancode 34 and in the AltGr field I enter a0 for Application shortcut 0. 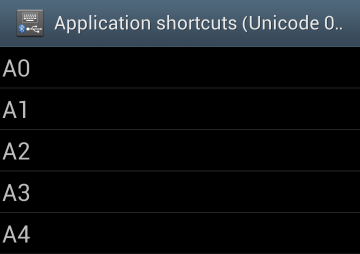 The app will automatically change a0 into unicode 0x2410 so I could, if I wanted, have entered 0x2410 directly. However entering a0 (or A0) is much easier. I repeat the procedure for M (scancode 50) and enter a1 in the AltGr field. For mapping the Text string the procedure is the same and I enter t0 in the AltGr field for A (scancode 30). 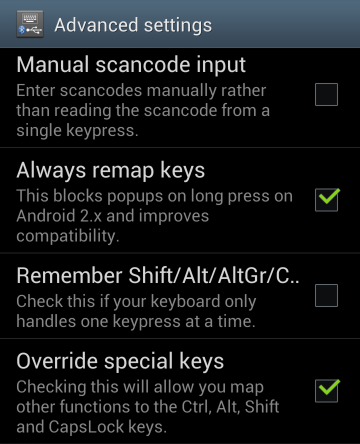 Back in the list of remapped keys I can see the new mappings. Checking the mappings confirms that a0, a1 and t0 are translated into 0x2410, 0x2411 and 0x2400. This is the end of tutorial 5 that should give you a pretty good idea on how to setup Application shortcuts and Text strings for yourself. This is the 4th tutorial for External Keyboard Helper and it is based on a real support question I got yesterday. Let's say you have a compact bluetooth keyboard that doesn't have an Alt or AltGr button. However you want to use the US-International layout which has a lot of extra characters that can only be reached with AltGr and AltGr+Shift. In this example I will show you how to sacrifice the (in my opinion rather useless) CapsLock key for a more useful AltGr key. First I select the layout I intend to use. In this example the English (US-International) layout. I choose to Customize keyboard mappings. then Add a new key mapping. 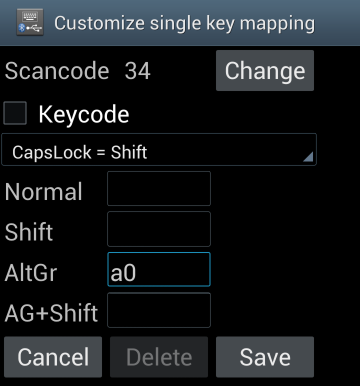 Pressing the CapsLock key makes it read it's scancode which is 58 and I check the Keycode checkbox and choose Right Alt modifier as the keycode I want to map it to. To make sure External Keyboard Helper ignores whatever the Android system things that the CapsLock state is I must also check Override special keys and make sure Always remap keys is checked. That's it. CapsLock now serves as AltGr and I can access all the special characters that my selected layout has mapped for AltGr and AltGr+Shift even though my keyboard does not have a physical Alt or AltGr key. I finally gave in and preordered a Google Nexus 10 from the UK as I've seen no date on when it will be available here in Sweden. Looks like a very nice device and I want to get my hands on Android 4.2 but since I recently bought a Samsung Galaxy S III I cannot really motivate getting a Google Nexus 4. At least not for now. Funny that a 10-inch tablet has a higher screen resolution than my 42-inch plasma and my 23-inch computer displays at work but I'm not complaining. However, it is not the high res display that I'm most looking forward to try, but rather the features of Android 4.2. Finally tablets will get multiuser support which is something I've felt been missing since I got my first tablet. 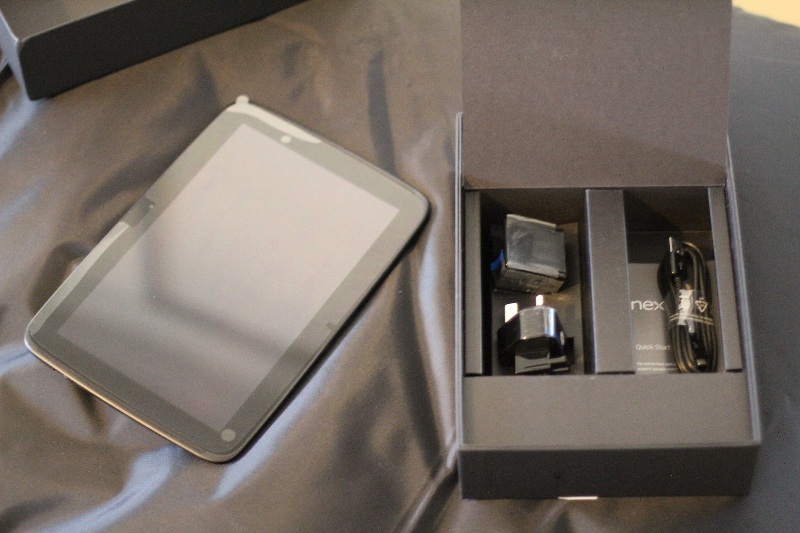 I'll try to make some unboxing photos when it arrives but I suppose the net will flooded with Nexus 10 unboxing pics and videos by then so I may not bother. This is the third tutorial for External Keyboard Helper. You'll find the first tutorial here and the second tutorial here. After some testing I find some things I want to address. 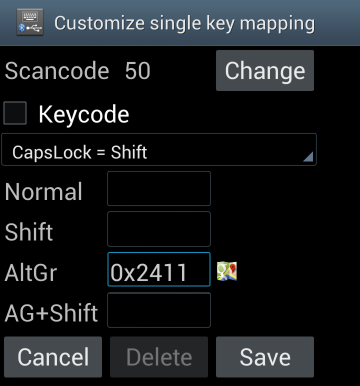 First of all since my Targus iPad keyboard uses scancode 139 this conflicts with the menu key on my Samung Galaxy S III so when remapping scancode 139 to Back (see tutorial 2) I also remapped my menu key on the phone. This I will address using the Device ID filter in the Advanced settings. For most phones the buttons on the phone uses device ID 0 or a negative number. 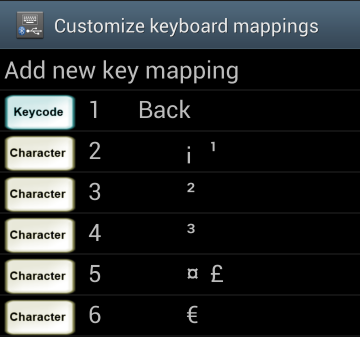 For this the default setting will make sure they are not affected by the remapping in External Keyboard Helper. However for my Galaxy S III running Android 4.1.1 this is not the case. The first step is to use the Debugging screen to find out what device ID the phone buttons are using so I enter Advanced settings and then Debugging. 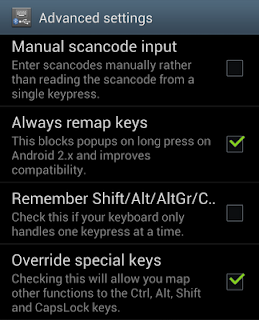 Pressing the menu button on the phone both confirms that it uses scancode 139 and that it uses device ID 5. So now I now that I don't want External Keyboard Helper to touch anything that has device ID 5 or lower so I set the Device ID filter to 6. I also find the keyboard repeat to be a little bit to sensitive for my taste so I change the delay to Slight delay. 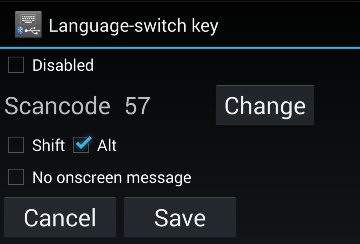 I also want to be able to switch between my custom layout (based on the Swedish layout), the Xperia Play layout and no remapping at all so I setup a Language-switch key. I also check that I want to use a third layout. I then choose the Xperia Play layout as my second layout and let the third keep it's default setting (No remapping). This is the end of tutorial 3.